When you think of K2, you think of awesome skis, maybe even snowboards for those of you that ride. One thing that hasn’t come to mind, up until this year, is ski boots! Yep, now you can pair your favorite K2 skis with a pair of K2 ski boots. 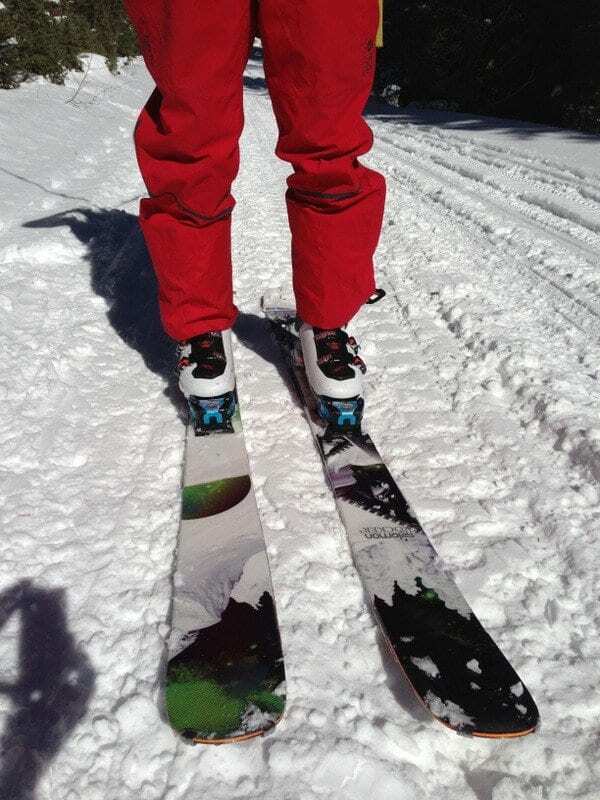 I have been testing out the K2 SpYre, a women’s ski boot that is available in two flex options, 80, 100, and 110. I am use to a super stiff race boot, so I opted to test out the K2 SpYre 100. Slipping my foot in the K2 SpYre 100 for the first time was like slipping on a plush pair of boots that were ready for a full day on the slopes! Just because the K2 SpYre 100 felt nice on, doesn’t mean that they don’t perform. The K2 SpYre features a cuff and shell that are locked together without rivets; the designers created a boot that allows the wearer to efficiently transfer energy, without wasting energy or power. The K2 SpYre 100 also features K2’s PowerFuse SpYne, which keeps the boots’ lateral stiffness and flex. The K2 SpYre 100 flex skied strong enough to handle whatever I encountered, powder-crud-carving, without feeling too soft or too stiff. The SpYre 100’s come with a LuxFit Intuition liner. The liner is heat moldable to allow you to get a customized fit of your foot and your shin. Out of the box, without the heat molding, these liners are comfy on the feet and feature extras such as soft fleece lining to keep your feet warm on cool days. The K2 SpYre 100’s feature asymmetric tongues, which are also heat moldable, to help reduce shin bang. Unfortunately, I found that the tongue often rotates, or slides to the middle, making my shin rub against the plastic cuff. I have tried to tighten the buckles and top strap, but in order to keep the asymmetric tongue in place I really have to crank down on the buckles, which is not comfortable and leads to numbness in my toes. I hope that I can repeat the molding process to get a better fit and avoid this problem. The K2 SpYre 100 features a medium width and I found the toe box to be spot on; I do feel that the heel area is a bit deep for me, but this is a problem I have with most boots and even shoes. In order to get a customized fit, simply utilize the micro adjust alloy buckles and the extra long power strap. Being a women’s specific model, the cuff features a lower rise than whats offered up in the men’s model. Walking to the lift was often treacherous with my old boots due to the slick, worn down, outsole. Fortunately, this will not be an issue with the K2 SpYre 100’s, as they feature replaceable outsoles composed of Thermo Plastic Rubber (TPR) with Thermo Plastic Urethane (TPU). K2 also incorporated a padded mid-grip; which in layman’s terms means the addition of Thermo Plastic Rubber in the forefoot/arch area to increase traction while walking on uneven surfaces. The K2 SpYre boot features a medium amount of flex, medium width, but provides more than middle of the road in terms of performance. The K2 SpYre should be worth a look at the boot shop this spring, as the price point is pretty fair with respect to the features for a high quality intermediate boot.